It's the carnival season again! We're all getting pretty excited as 11 June and Arbury Carnival draw nearer. This year's theme is "Beach Party". 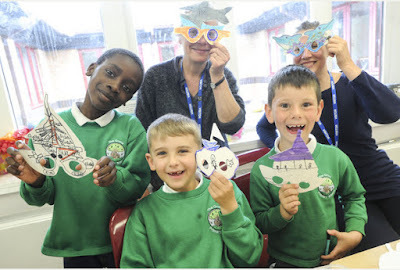 Thanks to Kettle's Yard, who are sponsoring our work with community groups in the Arbury, we had a great day with year 2 children from the Grove Primary school making crazy sunglasses. for some more pictures by Richard Patterson of the 'spec-tacular' work. The next open session for making costumes at Nunn's Way Pavilion is on half Term Friday 3 May '16 at 3.30pm and we have a banner making afternoon with giant octopus on Saturday 4 May '16 from 1.00- 3.30pm. Everyone welcome - come along, it's fun!